Is Kawasaki Disease Contagious? Get All Your Questions Answered Here! Kawasaki disease mainly affects children under the age of 5. It causes inflammation in the walls of the medium-sized arteries all over the body. This inflammation affects the coronary arteries, which supply blood to the heart muscles. This disease is also known as Mucocutaneous Lymph Node Syndrome as it is known to affect the skin, the lymph nodes and the mucous membranes of the mouth, nose, and throat. Though the cause of this disease is still unknown, if the symptoms are recognized in time, the children with this disease can recover early after treatment. If Kawasaki disease is left untreated, it can lead to significant complications. Is Kawasaki disease contagious? No, it is not infectious. In the second phase that begins around two weeks when the fever started, the skin of the child’s hands and feet start to peel off in large pieces. He may even have pain in the joints, vomiting, diarrhea, and pain in the abdomen. The Kawasaki Disease foundation has found out that this disease is known to affect more than 4200 children every year and it is more common in boys than in girls. This disease occurs in children of the Asian and Pacific descent. The exact cause of his condition is however still unknown. Researchers have concluded that this disease may occur because of a mixture of genetics and environmental factors. This disease is also known to occur during specific seasons to the children of the Asian descent. 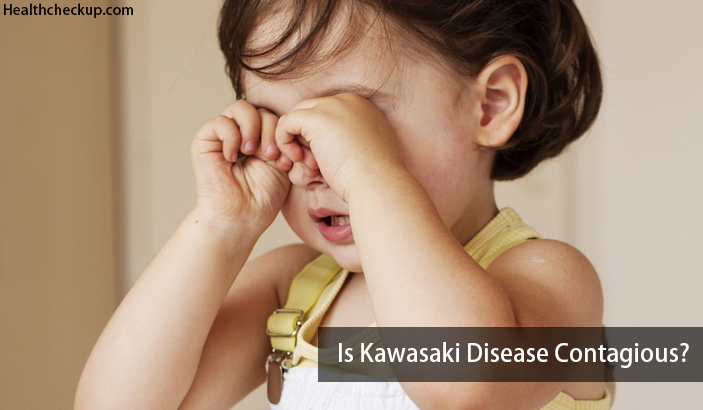 Kawasaki disease is one of the conditions, which are still yet to be adequately identified. The cause of the disease is unknown, and the disease is rare. The disease is common in Japan than in most of the other countries. Some scientists feel that one of the causes of the disorders may be a conventional virus that may cause an overreaction in the infection fighting the immune system in your children. Is Kawasaki illness contagious? Though Kawasaki disease is rare, it is not infectious. Your child would not be able to catch the disease from any other child or any other conditions. The disease also has not been proved to be found. Though the help of the microorganism might trigger the infection, it is rare for more than one child in a family to have the Kawasaki disease. If your child is suffering from this rare disease called Kawasaki disease, then he can easily be treated for the same. Your child will be treated with immunoglobulin which is a blood product made of concentrated antibodies from donated blood. Your child will receive it intravenously through a vein. This immunoglobulin helps in reducing the damage to the heart. This should be incorporated ten days within the initiation of the illness. Without treatment, the chance of heart damage is about 1 in 5. If your child has had heart damage, then aspirin may be prescribed by the doctor. Long-term aspirin therapy to treat Kawasaki disease in children has potential side effects. You may be getting confused if there are any types of complications of the Kawasaki disease? One of the significant side effects of the Kawasaki disease is damage to the heart. One of the most common kinds of damage has occurred by irritation or inflammation of the blood vessels that help to carry blood to the heart. If you feel that there has been considerable damage, then your child would have to be under complete medical checkup. The heart damage will heal on its own in half of the children, as they are young and agile. Can Kawasaki Disease Recur Once Again? If your child is suffering from Kawasaki disease, he/she needs to be under complete medical scrutiny. Your child needs to be checked by a heart specialist periodically. With the right treatment and care most of the children who have Kawasaki disease recover within a few weeks of getting the disease. It is rare for a child to get the disease more than once. This disease does not recur usually. According to the latest research, we have seen that Kawasaki Disease is not contagious. It does not spread among family members or children in child care centers. The main reasons for this illness are still unknown, and the condition is known to be rare as well however the immune system of the body can initiate it according to doctors. So if you want to know whether Kawasaki disease is contagious, this disease is not infectious, but at the same time, the condition is unknown as well.